The land of sun is the land of the tastes. This biblical country still preserves the aromas and flavorings that you may very well remember from your childhood, from the times when fruit and vegetables didn't come neatly packaged in boxes, with same size and color. Delve into the secrets of the Macedonian cuisine; into the endless variety of fresh salads, cheeses and the unique, mouthwatering mix of traditional recipes of the many cultures and religions who live in this beautiful Balkan state. The Macedonian hike will take in some of the best of the mountain scenery in the Shar and Pelister ranges. These ranges are magical landscapes of snow-capped peaks, alpine meadows, glacial lakes, medieval villages and mature forests. The wildlife is rare with wolves, bears, boar, chamoix, golden eagles and lynx all still resident in the mountains. You will be in the hands of competent guides, walking for between 5 hours and 8 hours daily. We won’t walk the entire range, but we will select the best chunks and include monasteries, mountain villages and historic towns. A bit of horse-riding may be possible for the foot-weary. Macedonia Travel has direct sell of all scheduled and low cost airlines through its IATA BSP link.We personally calculate all air-fares in order to give you the best possible offer. Please insert your travel information in the form and send your request. Your complex travel offer will be sent to you by email in few hours! Book your HOTEL, GUEST HOUSE or MOUNTAIN HUT accommodation in Macedonia. Macedonia Travel is the leading provider of accommodation in Macedonia, offering to the visitors the widest choice of accommodation in the country through its own network of selected hotels, guest houses and mountain huts. Your business meetings, events and seminars will be arranged with expert care and attention to all key details, in the most creative, purposeful and cost efficient way. 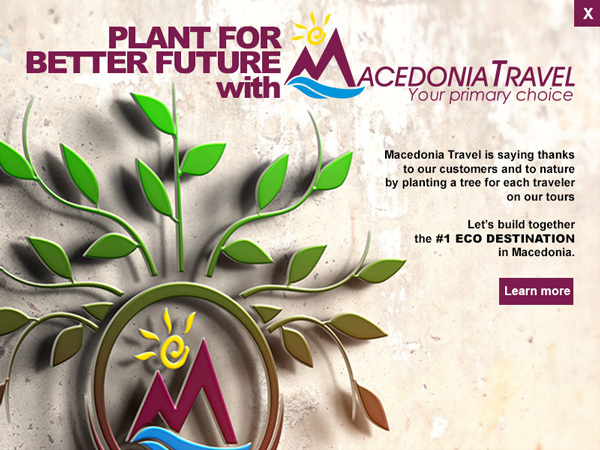 Macedonia Travel will become an extension of your organization to assure that your event is carefully planned with uniqueness, creativity and value! Macedonia is a small country between Greece, Albania and Bulgaria, which is rarely visited despite its rich culture and wonderful landscapes. A macédoine refers to a rich mix, which accurately reflects the many languages and cultures in this beautiful Balkan state. In some of the most stunning and often remote locations, you will find Orthodox monasteries and churches, many dating back for over a thousand years. With their well-preserved mosaics, frescoes and woodcarvings they are well worth a visit. Another site of interest is the Kokino megalithic observatory, dating from 1815 BC, which NASA has ranked among the world’s oldest observatories. Ohrid is one of Macedonia's highlights and both the lake and the town have been put under UNESCO protection. The lake is among the oldest in the world, with unique flora and fauna, and is a popular tourist destination in summer, and Ohrid carries special spiritual significance as the center of Slavic literacy and home of as many as 365 churches, a Roman amphitheater and Tsar Samoil’s fortress. Macedonia has much to offer and is a safe and welcoming place to visit. At the same time, it is unknown enough to make you feel like you are trying something new and one thing you are guaranteed to get from people on your return from Macedonia is looks of incredulity and curious questions.